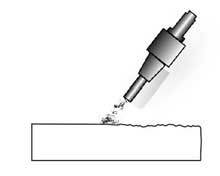 You can precisely drill very small holes (as small as .005 in.) through almost any material. 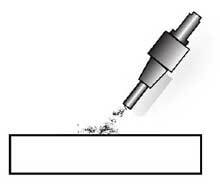 Holes can be drilled at odd angles and in hard to reach spaces where a normal drill could never go. 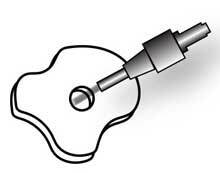 Remember, the Mirco-Blast process was created for drilling cavities in teeth. 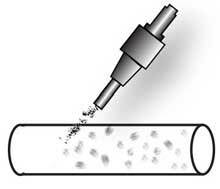 Holes are made without the head build up or igniting sparks associated with most types of drilling. By varying the type of powder used along with pressure and flow rates, precision cleaning of the most delicate items becomes an effortless task. You can accurately remove the smallest layers of material and get into otherwise impossible to reach places. 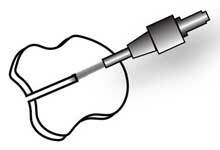 Etching or marking of materials such as glass, ceramics and metals is as easy as writing with a pencil. Many artisans use our equipment for their fine works of glass and metal. Jewelers use them on a continuous basis. Many deburring operations could not be performed without a Micro-Blast machine. It allows you to target with pinpoint accuracy the precise spot you need to work on. You can also use an angled nozzle to reach blind spots. Cutting with a very fine stream of abrasive allows for precise control of the cutting action. There is no shock to workpiece and you can proceed as slowly or quickly as you wish with a simple control adjustment. Again, as with drilling, there is no heat build up or sparking. Electrostatic Discharge (ESD) can be totally eliminated also with a simple attachments we can supply. Surfaces are often abraded to create unique finishes for later processes. You can polish smooth just about any surface in no time or make it rough as sandpaper. Peening is a process of working a metal surface to improve its material properties. 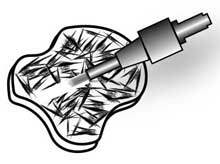 Glass Beads: Bead blasting is the process of removing surface deposits by applying fine glass beads at a high pressure without damaging the surface. Many medical items are made in stainless steel or other metals which are very shine. Glass beads are used to remove the surface shine to a flat surface. The lights during a surgery are thereby not flashing back to the doctors.